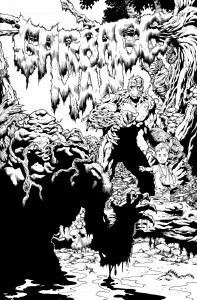 Shortly after publishing my last Epson printed sketchbook, “Unfinished Business”, I was contacted by Ross Ritchie of Boom Studios about doing a sketchbook for him. We decided to use a combination of the material from my first three books (since the print runs were so low, the material would still be fresh to most buyers) and a few new pieces to create my 4th sketchbook. 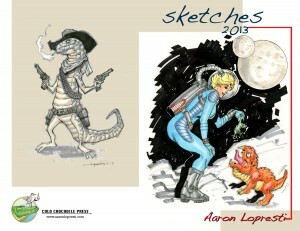 We cleverly named it The Aaron Lopresti Sketchbook! This ended up selling well over 1,000 copies as it was distributed through Diamond and other outlets. 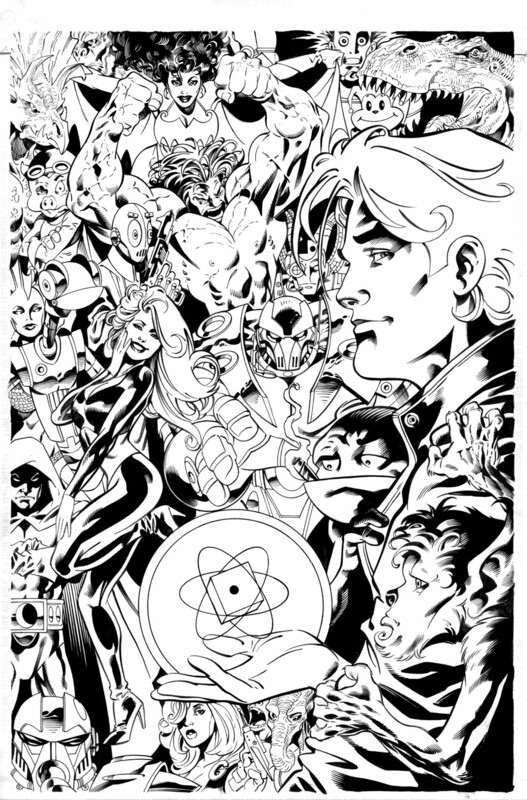 I followed this up in 2004 with an 8.5 X11 64 page perfect bound book that had both sketches and finished illustratioins in it, titled “Imagine This”. I actually rolled the dice and paid a real life printer to print me 500 copies which I signed and numbered and distributed through Diamond as well. It took about two years but I sold them all. 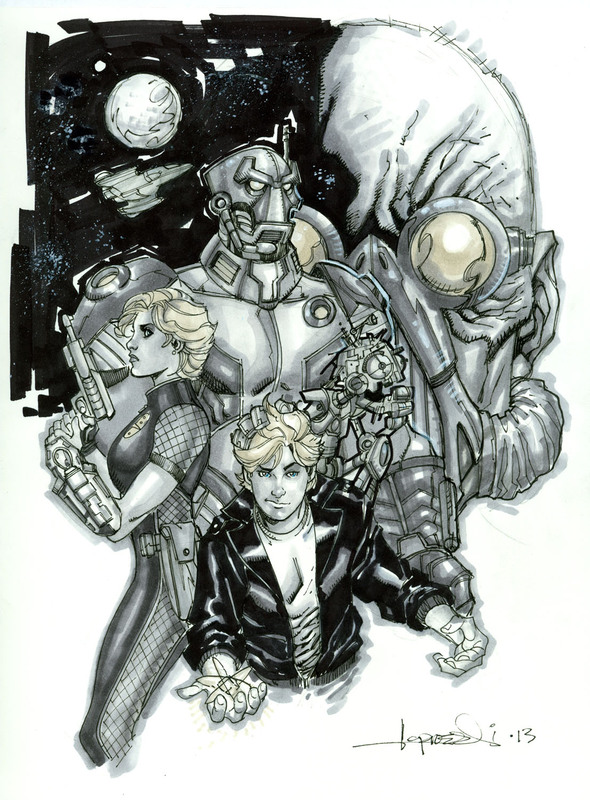 That led to The Aaron Lopresti Sketchbook vol.2 in 2007. This I was my most successful self published sketchbook in terms of selling out fastest. It also may be the best of my sketchbooks in terms of overall quality of the interior content. 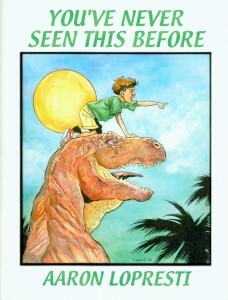 You may be wondering why I have not posted cover images of the fore mentioned books. After the 2007 book I started taking a hard look at the subject matter of my work and what I was really presenting myself as and I wasn’t to happy with myself. All those books had bikini-clad jungle girls on the cover, a clear bit of exploitation to try and sell copies. When I googled my name and all that came up was “girly” art I really had to take a step back and re-assess what I was in comics for. That combined with my Christian convictions as well as my young daughter looking over my shoulder when I was drawing, made me turn away from the “anything for a buck mentality”. So I moved forward with the intent of portraying female characters as beautiful and strong but with respect. The same way I would portray a male character. 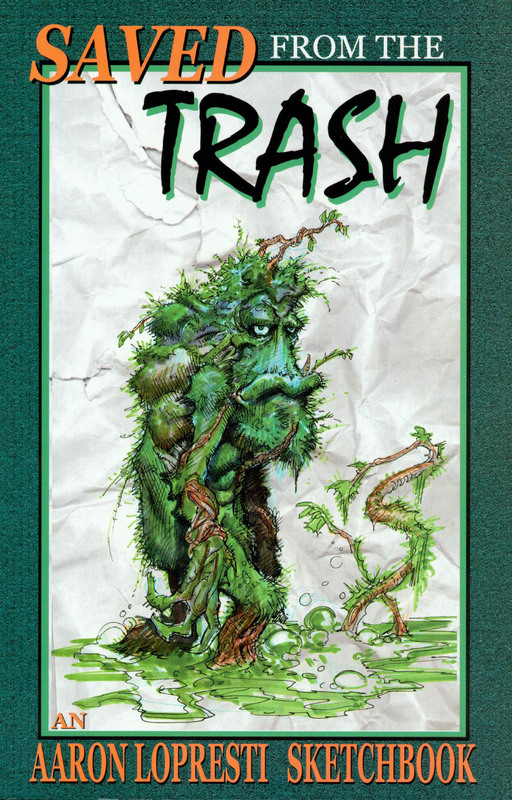 So in 2009 I went bold and did not put a female character on the cover of my “Saved From the Trash” sketchbook and paid the price. I did sell a good amount of copies over time and in fact they are still available on this website but it was slow going. I also put a lot of varying material in the book including a lot of humor and non-comic related images. The result I think is a really strong book. I printed up 1,000 copies instead of 500, put a bar code on it and sold it through Amazon along with Diamond. Definitely a great learning experience. As I stated in the previous blog my first sketchbook was published in 2000 and distributed at the San Diego Comic Con. The quality of that book troubled me so I invested in the new (at the time) Epson 2000P archival quality ink jet printer. Although the price per page to print was relatively high, it allowed me to print to order as opposed to spending a lot of money up front and having a large quantity printed at once. Strangely in 2001, I decided to print a limited edition art portfolio instead of a sketchbook (another failed attempt to bring back the 70’s). But that’s a story for another blog. In 2002 I published what I considered my first successful book. I was determined to have a higher quality product than even William Stout’s sketchbooks, so I printed the interior pages and cover on my Epson and then found a printer who could do perfect bound book binding. So I may not have been the first artist to have a sketchbook but I am pretty sure I was the first to have a perfect bound sketchbook. 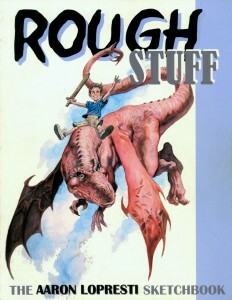 I named the book “Rough Stuff” (doesn’t seem all that original now) and sold it for $20. It was signed and numbered and limited to 150 copies. I actually only published about 65 copies. This is the first book I took with me to multiple cons which accounted for the “better” sales. However, my whole print to order idea was becoming a hassle in more ways the one. 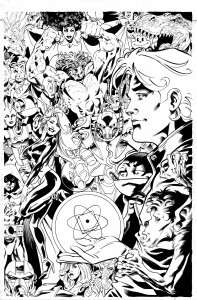 I came out with my next sketchbook in 2003 entitled “Unfinished Business” after I had moved to Florida to work for CrossGen Comics. I had an incredibly tough time finding someone who would do the square perfect bound binding and the result was a measly 25 copies printed (talk about rare). This was the end of my Epson printed sketchbooks. Today the artist’s sketchbook is a very common item in the comic book sub-culture. However, there was a time not too long ago when practically no on was producing these. There was the occasional big name artist that published one, Barry Smith’s “Shelf Stuff” (1975) comes to mind, but other than often crude and unauthorized fanzines, artist’s sketchbooks were not being produced. So when did this all change? When was the era of the modern artist’s sketchbook ushered in? 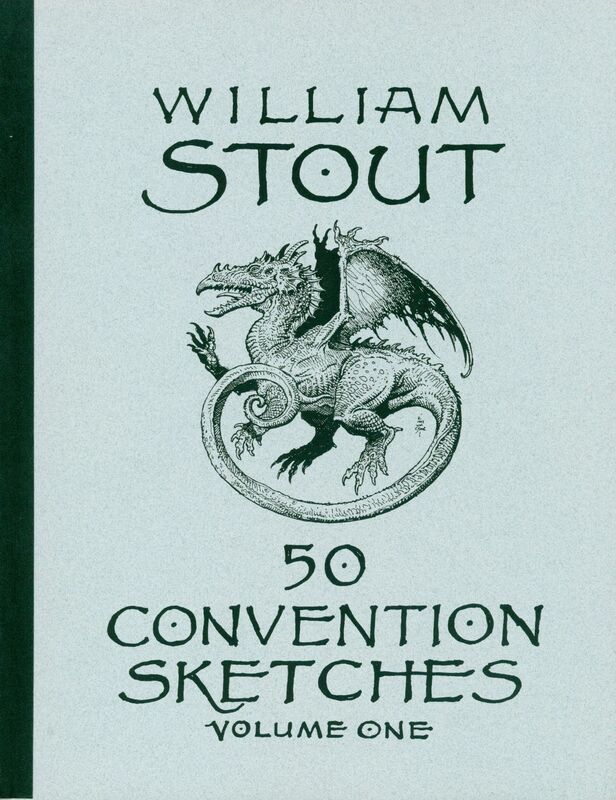 I am certainly no historian but I have been a regular con attendee and art connoisseur since the early 80’s and the first notice I had of a “con” sketchbook was from William Stout. 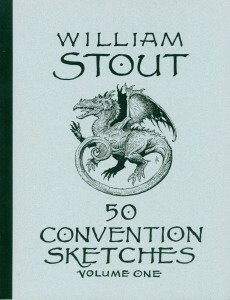 Bill’s published his first sketchbook in 1992 which was the year I first met him. At that time he impressed upon me the importance of having a booth presence at shows and creating merchandise to sell. He greatly inspired me in a lot of ways but I left our first meeting bound and determined to not only become a better artist but to also be a better business man. (One of Bill’s great strengths). Unfortunately at that time I was a complete unknown and was struggling to just get an assignment in comics. I did not have the exposure or developed talent to warrant a book on my work. But I kept my eye on Bill as he continued to produce sketchbooks and took notice that it was still not catching on with mainstream comics artists. By the year 2000, I had been working steady in comics for about 7 years and I felt it was time for me to get a booth at the San Diego Comic Con and start promoting myself. So with the use of a color copier at my local Lazerquick I “published” my first sketchbook with a print run of 20! (talk about a rare collectible) I felt at the time that I was not getting the proper respect from publishers and they were unaware of what I could really bring to the table so I came up with the title for the book, “You’ve Never Seen This Before”. This was a play on the content (unpublished art) and a call out to editors who didn’t think much of my work (probably warranted). This first book was just the beginning…. For 14 years I have felt guilty leaving the readers who bought the book wondering whose brain did Dr. Cruel have, what was up with Kenny’s dad and what would happen to Slim and Doogie? Well, one of the things I promised myself I would do once my website was redesigned was to make sure I had some new material appearing here. The first thing I established was this blog, the other thing I was and am committed to doing is starting an online comic. Atomic Toybox seemed like the logical choice. 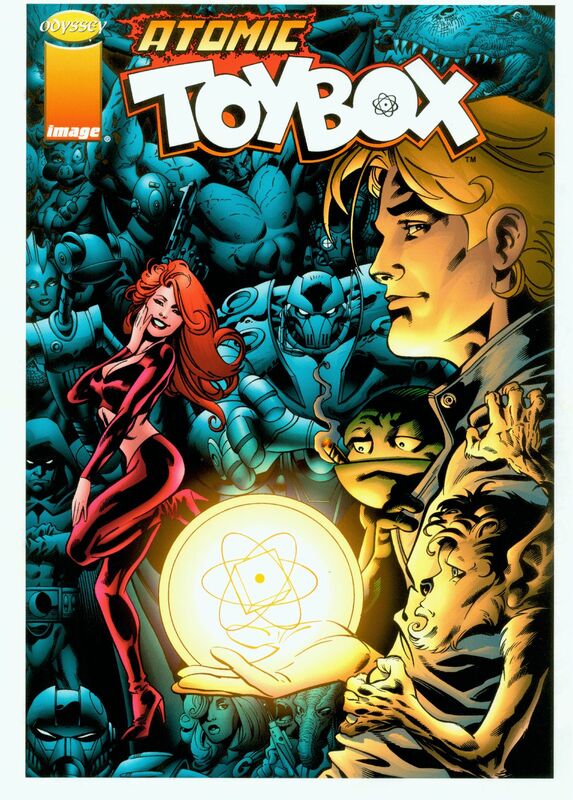 After re-writing the story and re-designing the characters, it dawned on me that maybe I should see if an established comic publisher would be interested in publishing Atomic Toybox. So I have been making the rounds with my revamped property. 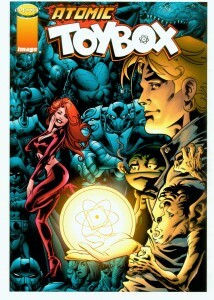 There appears to be an excellent chance that a publisher will pick up Atomic Toybox as a 4-issue mini-series. If not I will begin to run it right here as an online comic. Hopefully I will have a definitive answer in the next couple of weeks. In the meantime, take a look at the sketchbook promo piece I just did as well as the original cover to issue #1 that was never used (I don’t remember why). My New Sketchbook is almost here…. I recently reviewed the printers proof to my 2013 Sketchbook. I am expecting to have copies in my hands no later than February 26th at which time I will post them for sale on this website. They are full color and will be signed and numbered limited to 500 copies. The price on book will be $15 +2.50 shipping for internet orders. I will have the books with me at all of my convention appearances as well. My last sketchbook was two years ago and I won’t be doing another one for at least that long. What I would like to do is something bigger and maybe theme oriented. More finished artwork, maybe an “art of” book. I’ll see what happens. Here is the cover and back cover to my sketchbook, along with the pencil sketch of my first and rejected cover idea. This sketch is not in the book. I didn’t use it because the pose felt to artificial. 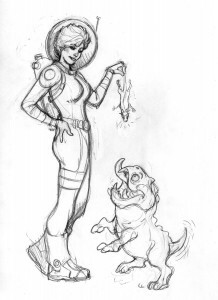 Although I do like the pose of the creature she is feeding in this sketch better. Oh, well. I also have to pump up the art on the title page. I did it especially for the book and it is one of my favorite all time sketch pieces. I am not going to reveal it here, though. You will have to buy the book to see it! Am I Too Old Fashioned? I often ask myself if my taste in comics is too old fashioned. I grew up reading comics in the era where the silver age was on its way out and the bronze age flush with monster books and sword and sorcery was coming in. Although I gravitated to the more “illustrative” books (monsters and barbarians) I still loyally read Spider Man, Captain America, The Avengers and the occasional new superhero (Luke Cage, Iron Fist, Warlock, etc). The superhero books of the 70’s still retained a strong Silver Age influence while taking conservative steps in trying to be more current with the changing times. Comics back then were fun. There were romantic relationships that were not overtly sexual. Characters died emotional and tragic deaths without gratuitous violence and gore. Superheros engaged in epic battles with super villains without anyone getting as much as a bloody nose. The Comics Code was in full force and yet we still had stories with complex relationships (see Peter Parker and MJ or The Swordsman and Mantis and even the strange duo of Scarlett Witch and Vision) and bizarre uncommon story lines (see Steve Gerber’s Howard the Duck). Writers and artist’s had to work harder to craft an adult or mature themed story into the confines of an all ages package. 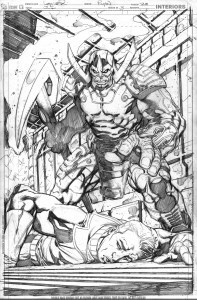 (see Steranko’s Captain America and Nick Fury or Neal Adams and Denny O’Neil’s Green Lantern/Green Arrow). There’s a reason Alfred Hitchcock is revered and no one knows the name of the guy who directed Friday the 13th (at least I don’t). I look back on my youth with fond memories of reading comics and having them transport me to a world that was imaginative, adventurous and (dare I say it?)….magical. Awwww, the good old days. 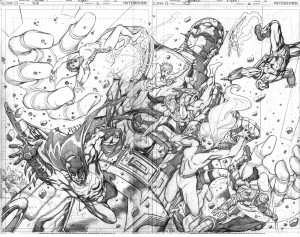 I have been fortunate with the last several projects I got to work on at DC. I tried to recapture the 70’s monster era with Garbage Man, I took a stroll through sliver age Kirby/Buscema- land (check out my Perraxus design; Galactus or Ronan the Accuser anyone?) 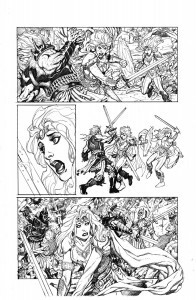 with the New 52 JLI and currently I’m exploring my Barry Windsor-Smith with Amethyst. Yeah, I guess I am old fashioned…..and proud of it!